Matt Bixler with his late son, Sam. Sam also found a home with the Battling Bishops football team. He played strong side linebacker and made all-conference one game. 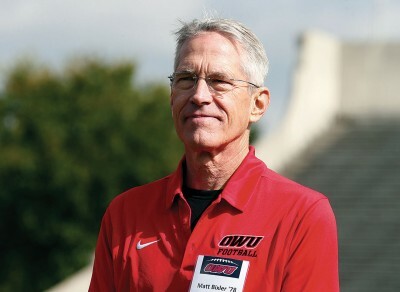 Mike Hollway, who coached for 25 seasons including Sam’s, helped recruit Sam to follow in his parents’ footsteps in coming to OWU. Sam’s mother, Kim Potter Bixler ’77, of Glen Falls, New York, died Dec. 13, 2017, after a long struggle with Parkinson’s disease. Her two sisters also attended OWU, as did Matt’s sister and brother-in-law. Sam was walking home one night in Cambridge, Massachusetts, in January 2018 when he was struck by a car. He passed away Feb. 14 as a result of his injuries. He was 29. 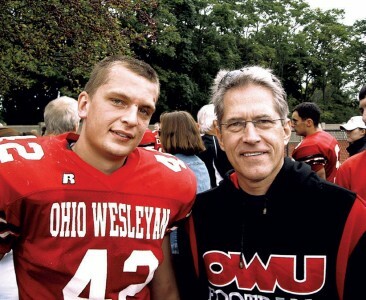 To honor Sam’s love of history and encouragement of students, as well as his own family legacy at OWU, Virginia Craighead ’72 and Michael Brooks ’71, friends of Sam’s parents, established the Sam Bixler ’10 Memorial Scholarship in April. “He had a passion to share what was working for him, which was excelling academically, in sports, and in life. He wanted to pass that on to other kids, and he was doing that when he died,” says Matt. Sam was working on his master’s degree in education policy and leadership studies from Boston University. Bixler stood in for his son as an honorary coach at the Oct. 13 football game versus Wabash. Sam and his sister, Meredith, both attended public school in Denver. Their high school was a magnet school for international students and refugees, with more than 30 countries represented among the student body. “Very early on he decided he wanted to teach young people,” Matt says. After graduating from OWU, Sam worked for Boys & Girls Club in Denver, then later at AmeriCorps in Lawrence, Massachusetts, then at Cambridge Rindge and Latin School (CRLS) in Cambridge, Massachusetts, as an advanced-placement history and social studies teacher in 2017. “I found out at the celebration of life event held in his honor at the high school that he drew a lot of kids into his classes, kids that normally wouldn’t try out for AP classes. They wanted to hear it from Sam. He had this way of being with kids,” says his dad.